I know I'm not the only middle-aged mom out there who's had a 20+ year intense relationship with her coffee. If that's you too, chances are we also share a thick middle, or what some health professionals call ‘coffee belly.' All I knew was that my waistline never returned after having my kids. Even though I dedicated myself to regular exercise and meditation, prioritized sleep, and minimized my stress, my belly remained. I now understand that I was developing insulin resistance and the stresses of everyday life were contributing to that, putting stress on my adrenal glands. After my adrenal crash, I understood that I needed to give my adrenals a break so that they could heal. This meant among other lifestyle changes, also giving up coffee. After a bit of research, I found this totally natural ‘coffee' replacement. 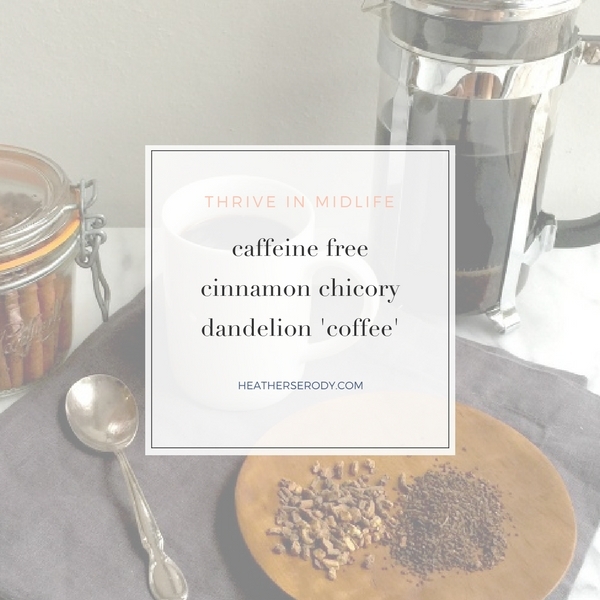 It helped me get off coffee in 4 days and I happily drank it for over six months while I healed my adrenals. I still like to make this at night once in a while when I'm craving something warm and sweet. I really, really encourage you to take a brave step and try living without coffee, at least for a limited amount of time. Let me know how you find it if you try it, too. You'll need to order some special ingredients & supplies from Amazon if you don't already have them. Heat the water to boiling in your kettle. Add all ingredients to your french press. Pour boiling water into french press and allow to steep for five minutes. After five minutes or so, press the plunger down and enjoy with your favorite creamer. I sweeten with Sweet Drops all natural stevia in toffee flavor.